Here we go. 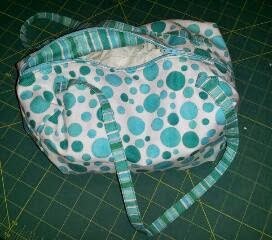 This is the pouch I made for the swap. I hope that she likes it. For my giveaway I will make one in the color of your choice. Just leave a comment about a swap you may have joined and why you liked or didn't like it. I will choose the winner by a random drawing next Sunday the 29th. Beautiful little pouch! I am sure you swap partner will love it. I have only joined a few swaps. I usually get too anxious about the whole process to really enjoy it. But I love getting lovely swap things from all over the place.